Julius Streicher (February 12, 1885 – October 16, 1946) was a prominent Nazi prior to and during World War II. He was the publisher of the Nazi Der Stürmer newspaper, which was to become a part of the Nazi propaganda machine. His publishing firm released three anti-Semitic books for children, including the 1938 Der Giftpilz (The Poison Mushroom), one of the most widespread pieces of propaganda, which purported to warn about insidious dangers Jews posed by using the metaphor of an attractive yet deadly mushroom. After the war, he was convicted of crimes against humanity and executed. Streicher's legacy also established a link between Nazi anti-Semitism, and Christianity's historical teaching of contempt of the Jews. In his self-defense at the Nurembeg Trials, he argued that if he were to be found guilty as accused, Martin Luther ought to be as well. Streicher had been presented with a first edition of the newly reprinted "The Jews and Their Lies," Luther's anti-Jewish tract. Many Lutheran Churches have since apologized for Luther's remarks, and for their impact on the treatment of Jews in "places where the Lutheran churches were strongly represented." Streicher was born in Fleinhausen, Bavaria, one of nine children of the teacher Friedrich Streicher and his wife Anna Weiss. He came from a devout Catholic family and his earliest memories are of praying with his mother. Streicher once recalled the village priest preaching about the Jews mistreatment of Jesus up to and including the crucifixion. Streicher is quoted as saying, "that was my first inkling that the nature of the Jews was peculiar." He worked as an elementary school teacher until joining the German Army in 1914. Streicher won the Iron Cross and reached the rank of lieutenant by the time the Armistice was signed in 1918. In 1913 Streicher married Kunigunde Roth, a baker's daughter, in Nürnberg. They had two sons, Lothar and Elmar. In 1919 Streicher was active in the Schutz und Trutz Bund, an anti-Semitic organization. In 1920 he turned to the newly established German Socialist Party (Deutschsozialistische Partei), the platform of which was close to that of the Nazi Party. Streicher moved it in more anti-Semitic directions, which aroused opposition. His battles with other members led him to take his followers to yet another organization in 1921, the German Working Community (Deutsche Werkgemeinschaft), which hoped to unite the various anti-Semitic Völkisch movements. In 1922, Streicher merged his personal following with that of Adolf Hitler, almost doubling the membership of the Nazi Party, and earning Hitler's lifelong gratitude. Hitler wrote a glowing account of Streicher's generosity in Mein Kampf. He participated in the Munich Beer Hall Putsch in 1923, which later gave him the privilege of marching at the front of the annual reenactment of the event after the Nazi takeover of power in 1933. In 1923 Streicher founded the racist newspaper, Der Stürmer of which he was editor, and used it to build up a deep hatred of everything and everyone Jewish. Eventually the newspaper reached a peak circulation of 480,000 in 1935. Streicher argued in the newspaper that the Jews had contributed to the depression, unemployment, and inflation in Germany which afflicted the country during the 1920s. He claimed that Jews were white-slavers and were responsible for over 90 percent of the prostitutes in the country. After the refounding of the Nazi party, Streicher became Gauleiter of Franconia. After 1933, he practically ruled the city of Nuremberg and was nicknamed "King of Nuremberg" and the "Beast of Franconia." In 1940, he was stripped of all party offices after being involved in major financial scandals involving Jewish property seized after the anti-Semitic outburst of Kristallnacht in November 1938. There were also accusations of him spreading untrue stories about Hermann Göring, several furious outbursts towards other Gauleiters and unconcealed adultery. Streicher, however, remained on good terms with German dictator Adolf Hitler until the latter committed suicide on April 30, 1945. On May 23, two weeks after Germany's surrender, Streicher was captured by the Americans. Streicher's first wife, Kunigunde Streicher, died in 1943 after 30 years of marriage. Streicher was married to his former secretary, Adele Tappe, just days before his arrest. 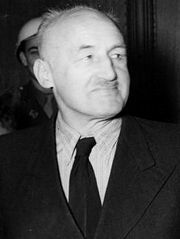 Julius Streicher was found guilty of crimes against humanity at the Nuremberg War Crimes Trial and sentenced to death on October 1, 1946. Streicher was not a member of the military and was not part of planning the Holocaust, the invasion of Poland, or the Soviet invasion. Yet his role in inciting the extermination of Jews was significant enough, in the prosecutors' judgment, to include him in the indictment. Consequently, he holds the distinction of being the only defendant from the Nuremburg trials executed solely for the expression of ideas. Streicher had a low IQ (102) and was thought to be mentally unbalanced however, his newspaper made him one of the most recognized members of the Nazi Party. During the trial Streicher declared several times that the jailers had tortured him. For reasons that remain unclear today, all of his comments on this issue were erased from the official protocol. But on the audiotape of the Streitcher's trial these comments are present. He also claimed that if he were to be found guilty, Martin Luther ought to be tried posthumously alongside him. His last words, before execution on October 16, 1946, were "Heil Hitler," and, "The Bolsheviks will hang you one day!." He is also reported to have cried out "Purim Fest 1946! "—Streicher evidently assumed that Jews would institute a new Holiday on the date of the hanging of himself and his fellow Nazis, as they had instituted Purim to mark the execution of their ancient persecutor and would-be exterminator Haman. ↑ Nichols, William, Christian Antisemitism: A History of Hate (Northvale, NJ: Jason Aronson, 1995 ISBN 9780876683989) p. 271. ↑ "Declaration of the Evangelical Lutheran Church in America to the Jewish Community," April 18, 1994, Jewish Virtual Library Declaration of the Evangelical Lutheran Church in America to the Jewish Community Retrieved January 10, 2008. ↑ The Martyrdom of Julius Streicher Retrieved January 10, 2008. ↑ Holocaust Studies Retrieved January 10, 2008. ↑ The Execution of Nazi War Criminals Retrieved January 10, 2008. This page was last modified on 14 June 2018, at 18:54.